I wrote my last blog entry this past Sunday morning about the preliminary results of the Original Miami Beach Antiques Show. Now that the show is over, I can report the final results. The show was close to a barnburner. Business continued strong on Sunday and Monday, with overall results in the top one-third of all the Miami Beach shows for the last 30 years. I also talked to many more dealers about their results and almost everyone agreed that business was very good. One dealer reported that he had a record show. Fortunately, very few dealers told me they did poorly, but there were a few. What was even more encouraging was that business was spread out over many clients, including several new ones. That’s always important and gratifying. I feel lucky when I’ve done a lot of business with a few clients, but not with many clients. It’s a sign that business is good and getting better. No one category was especially strong, with interest spread out over many. That too is encouraging. I did notice moderately strong interest in Tiffany lily lamps. I held off deciding on whether to exhibit at the Palm Beach Jewelry, Art & Antique Show until I could better gauge sentiment. After the Miami Beach show, I think it’s worth another try, so I’ll be there in a couple of weeks. I’ve always liked to exhibit there, but expenses are high, so it’s not a gamble I’m willing to take if business is weak. This time I’m optimistic. You’ll read my report in a couple of weeks and see if my optimism was warranted. In case you haven’t ever visited the show, it’s a good one. The exhibitors are high-end, with several of them exhibiting at very few shows. The overall quality is several notches higher than the Miami Beach show, with all of the objects vetted by experts. I’ll be bringing quite a few new items that I didn’t take to the Miami Beach show, so come and see me. You’ll surely enjoy the show. I’m writing this post on Sunday, with two days left to the show, but I can already give a basic report on the show results. Attendance was very strong for the first three days and included a good number of foreign buyers, but crowded aisles is not enough. It has to be accompanied by good sales, and sales were excellent. After speaking to quite a few dealers, strong results were almost universal. I personally spoke to only one dealer who said she was having a poor show. Unfortunately, there are always some dealers who don’t do well. It’s part of the normal distribution curve of results. Thankfully, this time the curve was skewed to the good side. So now I’ve exhibited in two shows in 2010 and both results were good. It’s starting to appear that business is returning to normal, a nice change from the relatively soft business of 2009. Sales were good in many categories, including R. Lalique glass, Rookwood pottery, Tiffany lily lamps and Icart oil paintings. No one category was especially strong, with sales distributed evenly over many categories. That’s noteworthy as a good indicator of improving business. Padding and wheel-carving are difficult glass techniques that add a level of sophistication and rarity to any French cameo glass vase. 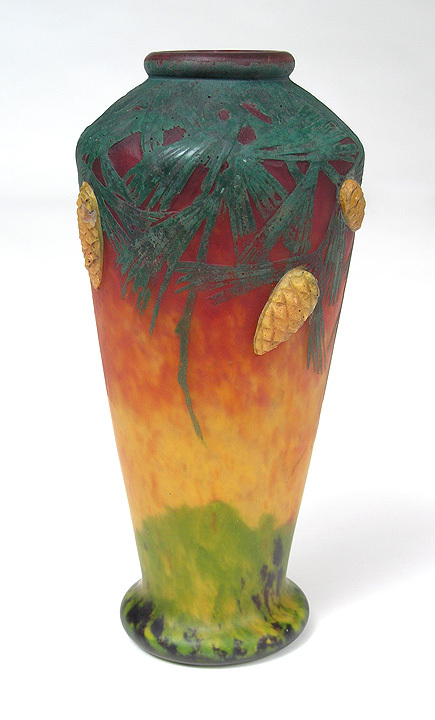 Sometimes the vases do not appear quite as colorful as some other vases with simpler techniques. Over the last several years, these sophisticated vases have become more difficult to sell to Americans. Americans want pretty, not sophisticated. Don’t get me wrong, there’s nothing wrong with pretty, but advanced techniques make for important pieces and should not be lightly dismissed. The most skilled glass craftsmen are needed to execute difficult techniques that require more time with hot glass for the padding and cold glass for the carving. My advice to Americans is to take a closer look at padded and wheel-carved pieces. Learn about the workmanship involved in their production and thereby gain a better appreciation for them. The prices of these important vases are down, so it’s an especially good time to add them to your collections. The Original Miami Beach Antique, at the Miami Beach Convention Center, opens to the public this Thursday at noon and will continue until Monday, January 25, 2010. It’s a huge show that attracts both exhibitors and attendees from all over the world. There’s always a lot of action, with millions of dollars of merchandise changing hands. Many dealers save their best items just for this show. Give yourself at least two days to see everything. It’s nice to be able to exhibit at two shows in the same city, back to back. In Miami, it’s almost like exhibiting in two different cities. 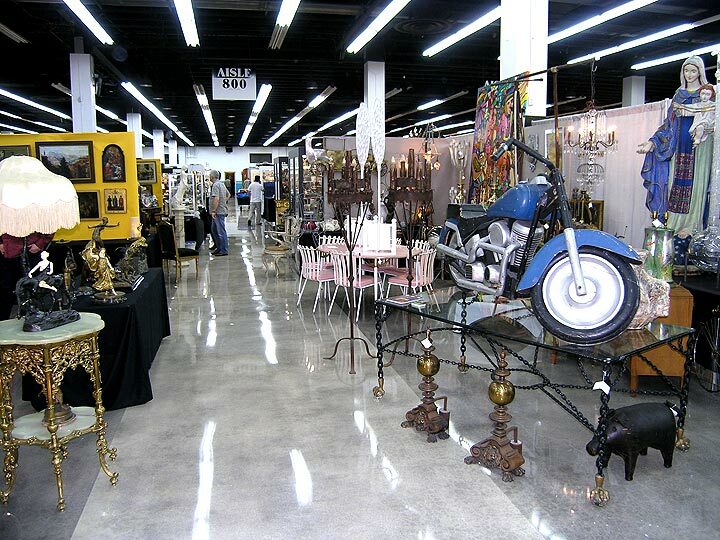 First comes the Miami National Antiques Show at the Miami Merchandise Mart near the airport. This year the show went well, even with light attendance. 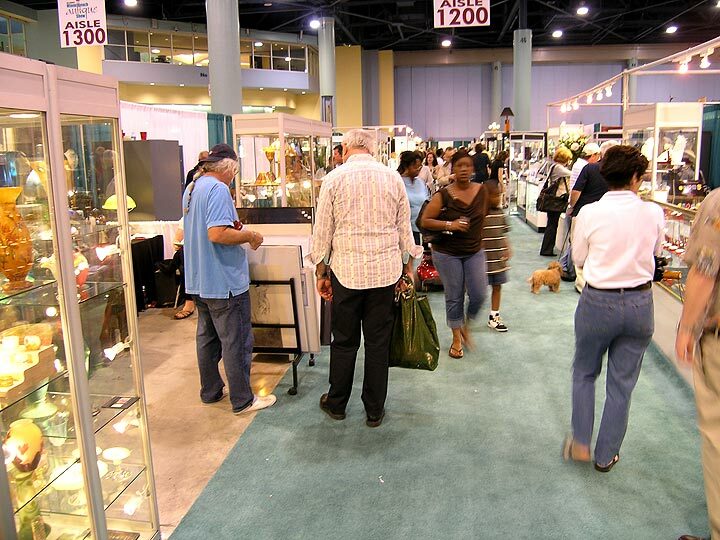 That show mostly attracts locals, with a few travelers arriving early to shop the show, before the big show the following week at the Miami Beach Convention Center. The Convention Center show is much bigger, with many more exhibitors and attendees. The merchandise is all fresh to the new arrivals and that’s very important. It’s also a big advantage to be able to divide the travel costs over two shows. And what’s better than being in Miami for two weeks in the middle of the winter? The level of competition amongst dealers buying from each other during setup is a good indication of business in general. This year the dealers seemed more restrained than in recent years. Plenty of items changed hands, but not with the usual level of intensity. I personally walked the entire show several times and didn’t buy as much as I usually do. However, I do expect that the show will be good this year, based on the level of interest from the attendees at the Miami National Antiques Show. News of the results early next week. I’m writing this blog at 2:30 PM on Sunday, so the final results are not yet in, but I have the preliminary results — the show is in trouble. Attendance was very light for most of the show, especially when I remember back 15-20 years, when the aisles were so crowded that it was difficult to move. Attendance at most shows in the US is down, but this one seemed down more than most. On a personal note, sales were good for me because the right people showed up. Almost all of my sales were to established clients (thank you to each and every one of you), with a couple to new clients. New clients are essential because established clients don’t remain clients forever. Some shows enter what I will term a “death spiral”. It’s hard to say which comes first, but here’s the gist of it. Fewer clients show up to buy, so sales are disappointing. Disappointing sales lead some dealers not to return the following year. The following year the show is smaller and lower quality, so attendance goes down because of word-of-mouth. You get the point — one bad thing leads to another until eventually, the show collapses. So what can a show promoter do? Take the patient to the ICU and treat aggressively. That means NO business as usual. Give the right medication and treatment and save the patient. 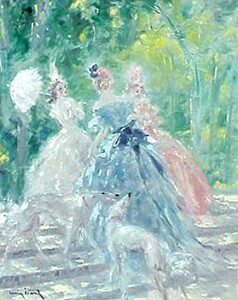 Take the Palm Beach Show Group as an example. They purchased the Baltimore Summer Antiques Show from Frank Farbenbloom. The show was OK when they bought it, but going nowhere. The new promoters were very aggressive in signing new, high quality exhibitors to the show, glamming up the look of the show and most importantly, advertising strongly. Now the Baltimore Show is on firm footing with high quality exhibitors, excellent attendance and good sales. The Atlantique City Antiques Show entered a death spiral that wasn’t fun to watch. Each year the show got smaller and business got worse until finally the show collapsed. Allison Kohler of JMK Shows is reviving the show March 27-28, 2010 with many changes and hopefully a very large advertising budget. One big change is that the show will only be held once a year. Good move, Allison. I wish her the best of luck (and me too since I’ll be exhibiting there). 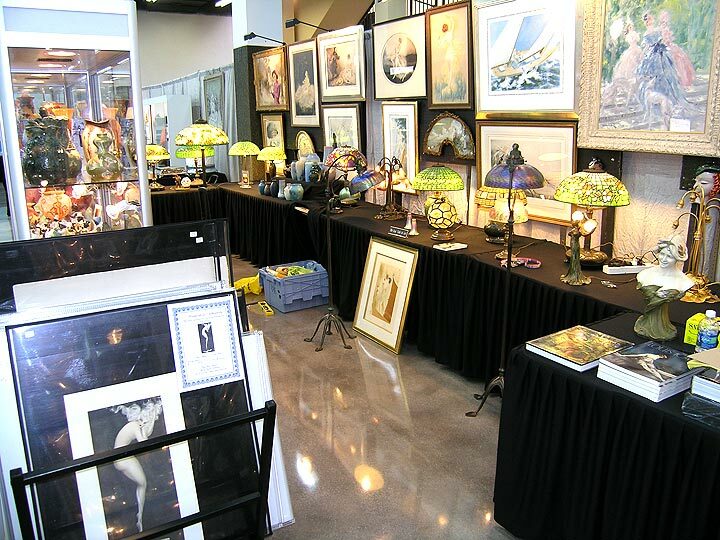 Rosemary Krieger is the very capable owner of Dolphin Promotions, the promoters of the Miami National Antiques Show. Rosemary, I know you read my blog, so take heed. This used to be a great show, so now you have to take dramatic action to renew and restore it and thereby break the cycle. Shorten the show to two days, Friday and Saturday, like the NYC Pier Show, so there will be bigger crowds and more energy. Greatly increase your advertising budget to include radio and TV. Increase free passes for the dealers to give out to their best clients. Make the parking free to the public. Sign new quality exhibitors with the promise of greatly increased advertising and a shorter show. Otherwise, my friend, the news is not good. 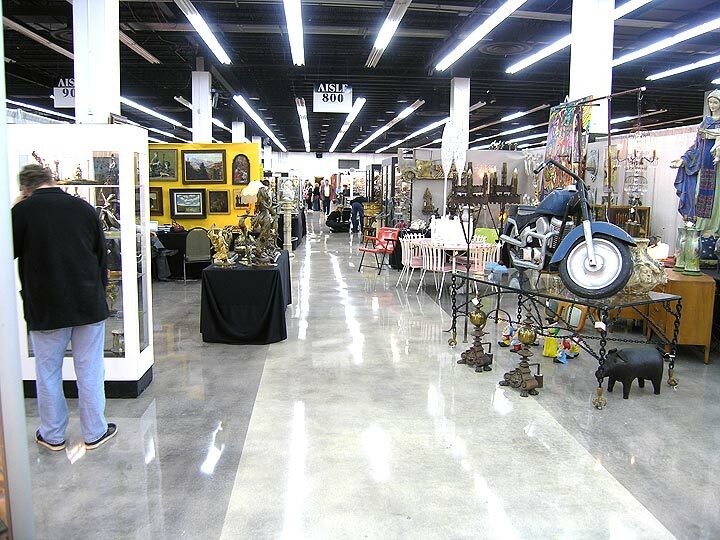 This week the eagerly anticipated Original Miami Beach Antique Show, opens to the public. It will be held at the Miami Beach Convention Center, Thursday, January 21, to Monday, January 25, 2010. It’s a huge show that attracts both exhibitors and attendees from all over the world. I’ve done business at this show with people from almost every continent. There’s always a lot of action, with millions and millions of dollars of merchandise changing hands. Many dealers save their best items just for this show. Give yourself at least two days to see everything. At this point, setup is finished and the show opens to the public today at noon. We’ve exhibited at this show for more than 25 years and have seen the show change over this time. Unfortunately most of the changes are for the worse. 25 years ago, the show was so crowded with attendees that the Fire Department closed the doors and would not permit additional people to enter until some people had left. Most show promoters today would give their right arms to get that kind of attendance. A complicated confluence of events has changed today’s show landscape. One important factor is the aging of dealers and buyers, without enough young people to replace them. Perhaps even more important is the profound effect of the Internet on the market (but that’s a whole other story for another day). Today’s show is smaller. No longer is there a second floor. The first floor is 90% full, but that’s less than 95% from the previous year. The overall quality of the show is quite high, but again a bit less than in previous years. A few of the better dealers are gone, replaced with a few borderline dealers. Is it worth visiting the show? Absolutely. There are important dealers, with a huge variety of the finest quality antiques. Guaranteed you will find something you like at the show. 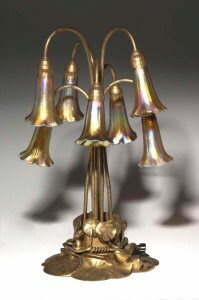 Yours truly has brought incredible Tiffany Studios lamps and glass plus French cameo glass by Daum Nancy and Galle plus a huge selection of Louis Icart original etchings at ridiculously low prices. Come visit me at the show and get first crack at everything, before the big Miami Beach Convention Center Antiques Show next week. I’ll post the results of this show early next week. 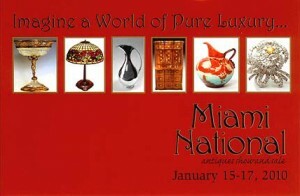 The Miami National Antiques Show, January 15-17, 2010. The first show of the winter season, the Miami National Antiques Show, begins tomorrow and ends on Sunday. It is being held at the Doubletree Expo Centre, Miami Merchandise Mart, near the airport. We’ve been traveling to Argentina for over 35 years. In that time, we’ve watched the changes in the antiques market there. Early on, we were able to buy fairly well, especially French Art Deco glass by companies like Schneider, who made Le Verre Francais. There was a plethora of Le Verre Francais, as a result of the success of Argentina in the 1920s. Argentina was wealthy and influential and much of that wealth was directed to France for the purchase of the finest quality glass and furniture. Unfortunately (for buyers), times have changed. The world discovered Argentina and siphoned off the best items, so today there is a much more limited supply. With access to the Internet, Argentines are up-to-the-minute on prices all over the world. Even 35 years ago, dealers would show me catalogs from Sotheby’s and Christie’s to justify their prices, so even then they weren’t in a vacuum. Argentina hasn’t suffered as badly as some of the countries of the world during this latest recession. Tourism is up, so foreign dollars are flowing in, and that seems to be a moderating influence. I saw tourists from many different corners of the globe, including Australia, France, Germany, Israel, Japan, and the US. Many people I spoke to said that business was fairly good. I’m quite pleased because Argentina went through a terrible crisis starting in 1999 that lasted for about three years. Many people lost their jobs, crime was up and civil unrest was high. During that time Argentina developed a bad reputation which scared off many tourists. Today there is no evidence whatsoever of the crisis. 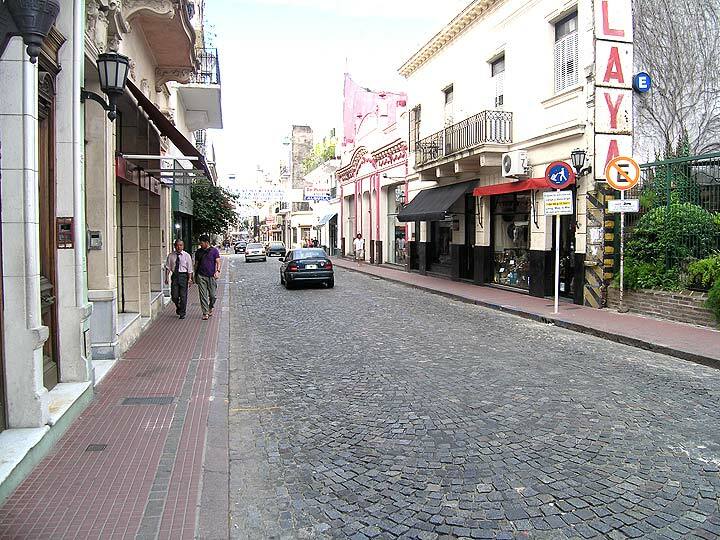 Buenos Aires is as safe as any other major world city. But I digress — back to antiques shopping. The prices I was asked for the types of items I buy were so high, that they sounded like telephone numbers, rather than prices. The same stores are still in business from a few years ago, so they must be selling to someone, but I certainly don’t know who that might be. I wish I did. For instance, I sell original Louis Icart etchings starting at $850, in great condition, with a certificate of authenticity. The lowest price for the same etchings in Buenos Aires was $2,000, in relatively poor condition. A Gallé vase that should have been priced at $6,000 was priced at $14,000. To top things off, Argentine dealers price their antiques in US dollars, not just now, but always. That’s smart for them, but takes away the exchange rate advantage for foreigners. I still suggest you visit the bohemian San Telmo neighborhood of Buenos Aires, which is the antiques center. There are many stores, with a wide array of items. It’s fun to search. I’m sure there are some good items available at fair prices, but you’ll have to be a determined shopper. For me, looking for important, mostly French items, it’s become a futile effort. 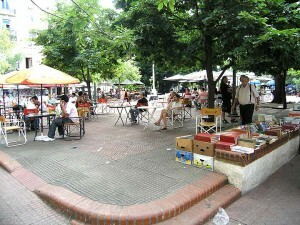 Sometime during your visit, take a break for coffee or dessert with dulce de leche, in Plaza Dorrego, in the center of San Telmo. This week starts a busy antiques season with shows in Miami and Miami Beach. The first, the Miami National Antiques Show, will be held from January 15-17 at the Doubletree Expo Centre, Miami Merchandise Mart, near the airport. It’s a beautiful show with important dealers. It’s also your opportunity to get first crack at the great items they’ll be bringing, before they go on the following week to exhibit at the Miami Beach Convention Center. Life is short, so after working hard during the year, we make the time to smell the roses. And the roses are in bloom now in the Southern Hemisphere — Argentina in particular. It’s a beautiful, interesting country, where the dollar is still worth something, so we try to visit regularly. On this particular trip, we got off to an interesting start when we arrived. Chelsea Clinton and her fiancé were on line with us for 1/2 hour while we waited at the airport in Buenos Aires to have our documents checked, so we had a chance to chat for a while. She’s really down to earth and lovely. They make a nice couple and we wish them the best. 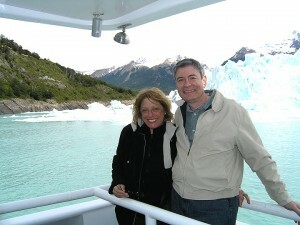 That's the Perito Moreno glacier in the background. I planned too hectic a trip, so we didn’t have enough time in each city, but we did get to visit El Calafate to see the glaciers, including the most famous one, Perito Moreno. You wouldn’t expect them to be blue, but they are, with some darker blues in some areas where the ice is more compact. We took an all day catamaran on Lago Argentino, for a beautiful day. 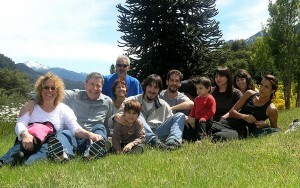 On to Patagonia to visit one of the more gorgeous parts of the earth — Villa La Angostura. It’s in the middle of beautiful mountains, lakes and streams. The air and water are clean. Just lovely to be there. January starts a busy antiques season with shows in Miami and Miami Beach. The first, the Miami National Antiques Show, will be held from January 15-17 at the Doubletree Expo Centre, Miami Merchandise Mart, near the airport. It’s a beautiful show with important dealers. It’s also your opportunity to get first crack at the great items they’ll be bringing, before they go on the following week to exhibit at the Miami Beach Convention Center.